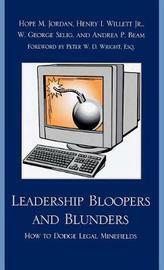 Leadership Bloopers and Blunders is a common-sense book on what not to do as a leader. The book is divided into six distinct chapters that help to identify common leadership mistakes that can lead to disaster for teachers and school leaders. This book shares real-life stories based on actual events. Some stories are based on court cases or events that made the news, while others were compiled from events shared by colleagues. Each story is followed by discussion questions to facilitate discussion to enhance leadership development. The chapters highlight legal and good-sense commentary on how to avoid leadership mishaps from those who have seen it all. Hope Jordan is a professor in the School of Education at Regent University where she directs special education teacher licensure and co-directs leadership with special education emphasis. Her presentations, publications, teaching experiences, and consulting keep her on the cutting edge in the field of education. Henry Willett is a former public school administrator and college president. He taught school law at multiple institutions and has given over eight hundred school law presentations to public and private schools. W. George Seligis a longtime school leader with administrative experience across grade levels from K-12 to post graduate in a variety of settings from rural America to large cities. He has never lost his zeal for education and for the students it serves. Andrea Beam is an assistant professor at Liberty University. She has experience in administration, special education, and elementary education.